Our March speaker was Peter Hingley, Librarian at the Royal Astronomical Society, who gave us a talk entitled "Piazzi Smyth: The Beginnings of High Altitude Astronomy"
The talk was centred on a now rare book called "Teneriffe, an Astronomer's Experiment", which Piazzi Smyth wrote in 1858. The photos in this book are in stereoview, two images side by side. Piazzi Smyth was born in Naples, Italy in 1809, son of English amateur astronomer, admiral William Henry Smyth. In 1846, Smyth succeeded Thomas Henderson (1798 – 1844) as Astronomer Royal for Scotland based at the Calton Hill Observatory in Edinburgh. 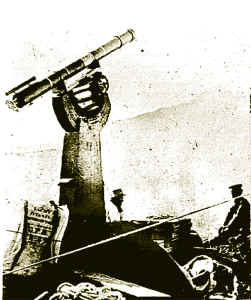 Smyth realised that cities were not the ideal place for astronomical observations, and thus he obtained funding to conduct experiments to see if high altitude astronomy was significantly better than at low levels. He borrowed a yacht from his friend Robert Stevenson (the son of George Stevenson, of train fame) along with its crew and his wife Jessica and sailed to Teneriffe in the Canary Isles in 1856. He took some refractors to use for his observations, one that was the 6.7" Sheepshanks refractor. He set up a low camp at 10,700ft on the side of a volcano called Alta Vista but he found there was a dust haze blown in from the Sahara up to 9,000ft. So, he moved camp up to a higher level and founded the first high-altitude observatory on the site of what is now the Las Palmas Observatory in the Canary Islands. His report to the British Admiralty on his expedition to the Canary Islands greatly influenced the next generation of astronomers. As well as astronomy, Smyth was also obsessed with the pyramids of Egypt and the science of pyramidology. He is the only person to have resigned his fellowship of the Royal Society, after they refused to publish his papers on this subject. He was a respected scientist and did important work in the new science of spectroscopy carving a pathway for the scientists of today plus when we think of astronomical observatories, we conjure up images of observatories on mountain tops. We have Piazzi Smyth to thank for that.